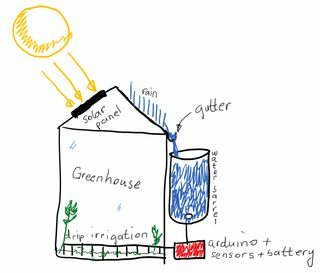 I wish to build an automatic watering system for my greenhouse and I would like to get some advice on how to do it. Water the plants when the humidity is under a certain value. How to build a solar charger for the batteries? I know that Li-ion needs some kind of Constant Current-Constant Voltage charger type so I was wondering how can I build such a system? Is there any way to know the state of charge of the battery without an advanced measuring equipment? Would a pump be more convenient than a solenoid valve, to let the water flow down? The challenge here comes from the fact that the valve or pump requires 12V, while to power the Arduino board, it needs only 5V (through the USB). How can I rectify these voltages? Can I connect a valve/pump directly to an Arduino or do I need extra power from the batteries? The questions might sound confusing because I'm not an expert in the field, and if it does, please let me know and I will try to add more details. I would appreciate any advice on how to make such a system and what extra components do I need. Use a 12V lead-acid battery, it's easier to charge safely. Ditch the pi, it's a 5W waste. Use an arduino instead. If you need wireless link, use an ESP8266 and not an arduino, the ESP8266 can be programmed in Arduino IDE. 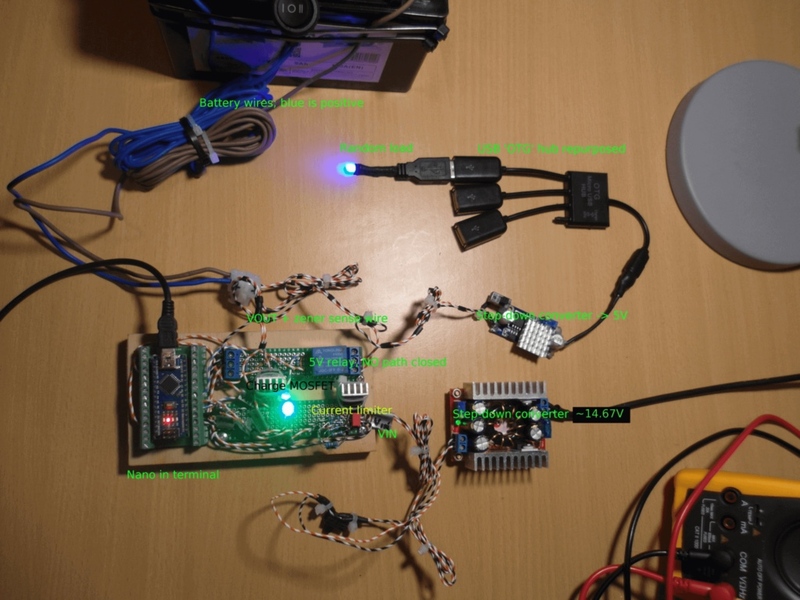 Check arduino.stackexchange for how to make a webserver on ESP8266. Personally, I would use an ESP8266 to send data to a Pi (in your house), and have the Pi make a nice page with graphs etc., at 60s intervals. Use DHT22 for temperature+humidity, or better, use SI7021. If you need many sense points for temperature, add some DS18B20 sensors. 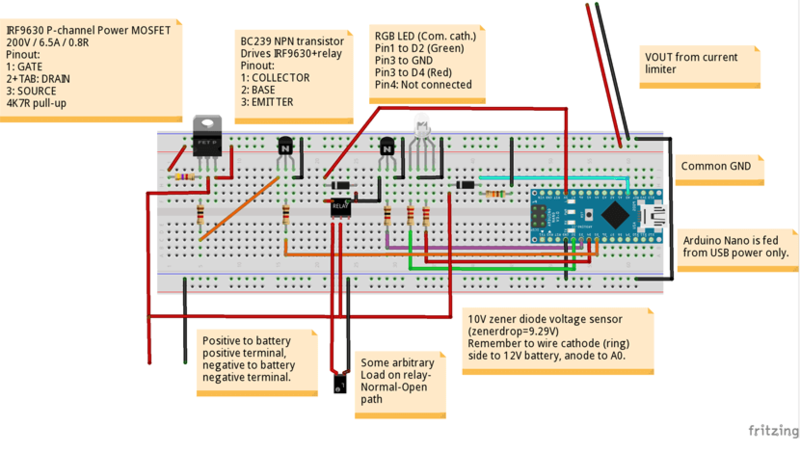 On the arduino, you can use the Narcoleptic library to drastically reduce power consumption. I never figured out how to do these three without some type of current sensor, so I just sensed battery voltage with a zener, and cut-off charging at ~12.7, waited, sensed again, and if necessary resumed charging. I charged with 13.5V @ 1A. There is a magic voltage at which you do not stress your battery, where you do not have to cut off charging, but I do not recommend it. You can consider a 12V battery 'empty' at 11.5V, I do not discharge below this mark. At this mark I disengage my loads with a relay and raise an alarm by blinking an RGB LED red. I have it on fairly good authority that lead-acid batteries can tolerate higher temperatures without losing efficiency, than all that Li-* stuff. Though I suppose I would probably embed my battery in a hole in the ground anyway (properly protected against humidity), to keep it out of harms way, and fairly cool. This works well enough for your application. I recommend getting some low-impedance Vgs MOSFETs to control charging. The IRF9630 P-channel MOSFET is okay, remember a pull-up resistor. If you want Li-* batteries, those 18650 batteries are cheap, but you need to put some money into the charge controller. You'll also likely need some step-up conversion to drive the various bits in your greenhouse, which wouldn't be necessary for a 12V system. For the solar panel itself, you need bypass diodes from with anode on negative terminal, for each cell, and a nice fat 2A blocking diode with its anode connected to solar panel Vout. When not illuminated, or saturated, these things consume power from an available source. Regardless of which voltage you need to charge, you will need a step-down converter to the charge controller input. 18V is just the rated output, it's going to be lower quite often. If a quality step-down converter is out of bounds, budget-wise, try an LM350 (it is lossy) voltage regulator temporarily. You should use a relay to drive the pump, and add bypass diode with anode on its negative terminal. A pump can be pretty noisy for arduinos. You may also want 100V 10-100uF decoupling capacitor on the pump circuit. See http://www.bristolwatch.com/solar_charger.htm - it's a very nice and verbose article. Please ignore the 14.67 input voltage, I had the novel idea of using a LM317 current limiter. Don't do that. Just use 12.7V. Use a battery management system to charge and monitor the charge level of the batteries. If you build it yourself, you stand an excellent chance of maltreating the the lithium batteries - causing them to fail and "vent with flames" which will cause your green house to go up in smoke as well. The BMS also solves your "how to monitor the charge state" question. Connect the batteries in series for over 12Volts. Use a buck regulator to get 5V to power the Pi and the Arduino. This way, you can power all needed parts from the batteries. Bucking down to the lower power for the 5V parts should be more efficient than boosting the high current stuff up to 12V. You cannot connect a pump or a solenoid directly to the Arduino or the Pi. You will either have to build an appropriate switching circuit (switches the 12V to the pump/solenoid using a 3.3V or 5V signal, many examples available on this stack) or purchase a relay module to do the switching. Whether a pump or a valve is sufficient depends on the physical setup. For gravity feed (using just a solenoid valve,) you need the tank to be high enough to provide enough pressure for the water to reach everywhere. For a pump, same problem - it must provide enough pressure and volume to water all of your plants, but still be low enough powered for your available power supply (batteries.) You will have to figure out how much water and how much pressure and whether gravity feed is enough or if a pump is needed. You should be able to connect the sensors directly to the Pi and eliminate thevArduino. Fewer parts is usually better. Not the answer you're looking for? Browse other questions tagged arduino battery-charging raspberry-pi solar-cell water or ask your own question. How do I calculate how much solar power I need for a system? Will this Solar-Electric hybrid circuit work?